EXOTIC INDIA ESCAPES respects your privacy and recognizes the need to protect the personally identifiable information (any information by which you can be identified, such as name, address, and telephone number) you share with us. We would like to assure you that we follow appropriate standards when it comes to protecting your privacy on our web sites. In general, you can visit Exotic India Escapes website without telling us who you are or revealing any personal information about yourself. We track the Internet address of the domains from which people visit us and analyze this data for trends and statistics, but the individual user remains anonymous. There are times when we may collect personal information from you such as name, physical address or telephone number. It is our intent to inform you before we do that and to tell you what we intend to do with the information. Generally, you will have the option not to provide the information, and in the future you will be able to "opt out" of certain uses of the information. If you choose not to provide the information we request, you can still visit the Exotic India Escapes website, but you may be unable to access certain options, offers and services. Exotic India Escapes will not sell, trade or disclose to third parties any information derived from the registration for, or use of, any online service (including names and addresses) without the consent of the user or customer (except as required by subpoena, search warrant, or other legal process or in the case of imminent physical harm to the user or others). Exotic India Escapes will allow suppliers to access the information for purposes of confirming your registration and providing you with benefits you are entitled to. 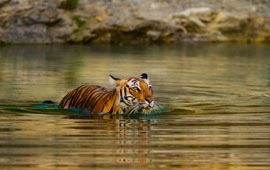 Exotic India Escapes will take appropriate steps to protect the information you share with us. We have implemented technology and security features and strict policy guidelines to safeguard the privacy of your personally identifiable information from unauthorized access and improper use or disclosure. EXOTIC India Escapes will continue to enhance our security procedures as new technology becomes available. Thank you for using Exotic India Escapes!